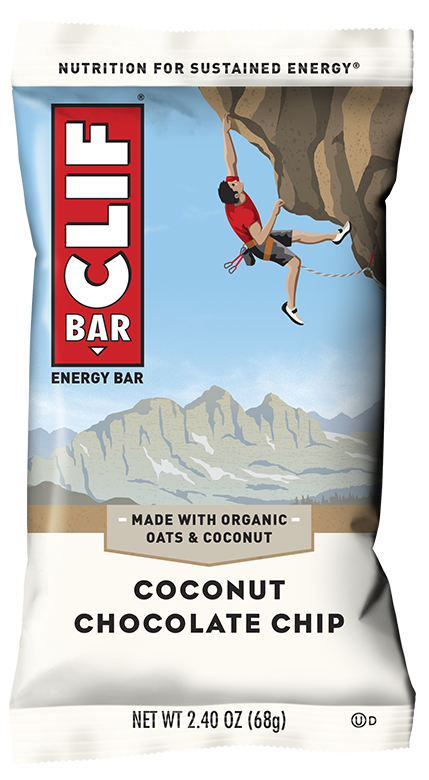 Other Products by Clif Bar. Search other Protein Bars products. 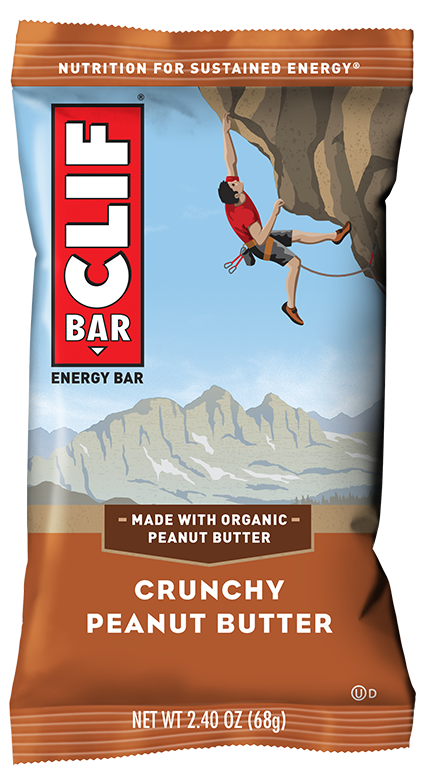 The Clif Bar was the first addition to the product range many years ago. It was originally put together by Gary in his Mother's kitchen! He wanted a bar that not only delivered quality flavour and texture, but nutrition too. So whether you're taking to an Australian beach for a marathon run to the nearest lighthouse or hiking through the wilderness, you can be sure that a Clif Bar will put some wind in your sails! With a mix of whole grains, protein and fibre, these energy bars gives you a sustained boost so you can be in it to your limit. When it comes to endurance, there's little more important than keeping your blood sugar topped up. This is how we tackle that steep mountain, raging ocean or unforgiving pavement. With natural brown rice syrup and the wholeome goodness of oats, you can be sure that you'll have energy to spare as you forge your way to your training or competition goals. 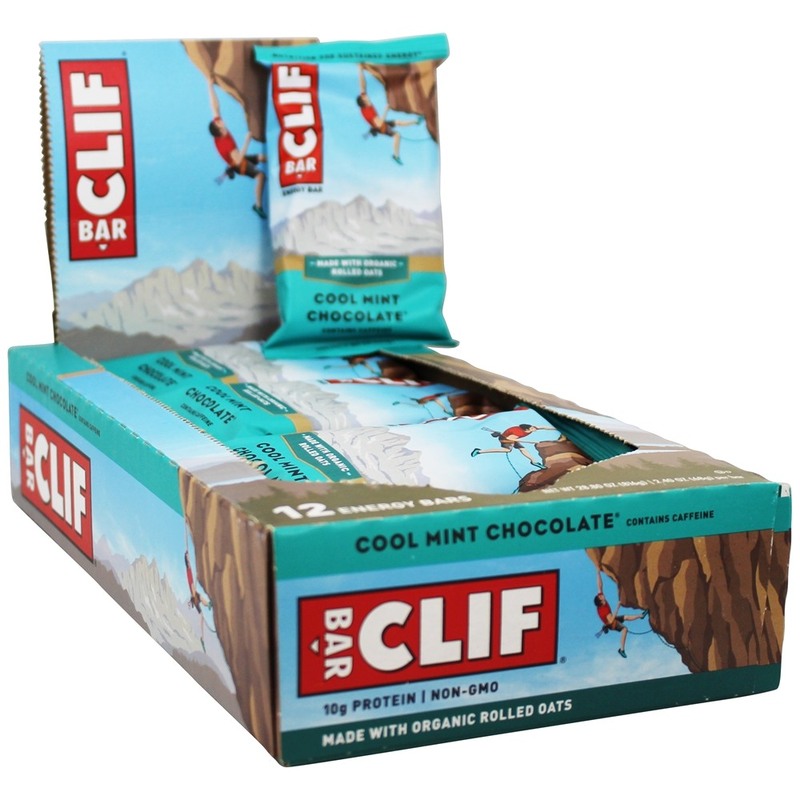 The Clif Bar deliver a small amount of natural fats and protein. This creates the perfect macronutrient balance for sustained energy, and also helps to keep the body's repair processes supported. Energy Bars make the perfect energy companion! 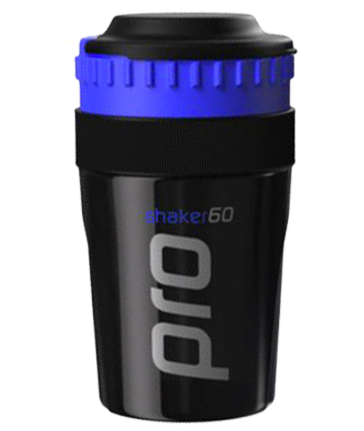 They can even be used during long bouts of resistance exercise or weight lifting. If you're ready to take your performance to the next level, pick Australia's most popular energy bar and go for it! The ingredients list of each bar reveals that there are no dairy or animal ingredients. So at first glance they appear to be vegan-friendly. 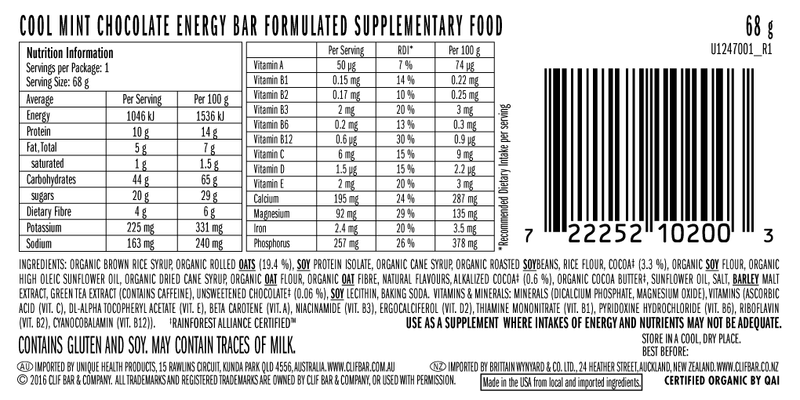 However, the allergen declaration shows that there may be traces of milk in each bar. This often happens in manufacturing facilities due to cross-contamination from another product that contains milk. Ultimately, this will be suitable for most vegan diets. Consume 1 bar 1-3 hours before exercise with a full glass of water. During low long-duration low-intensity training, such as jogging or bike rides, bars ay be consumed during the activity. Bars may also be consumed during mass-building weight lifting or powerlifting, or with a protein shake after exericise to enhance recovery. These bars may also be taken any time during the day or night as a nutritious snack. INGREDIENTS: Organic Brown Rice Syrup, Organic Rolled Oats (19.7%), Soy Protein Isolate, Organic Cane Syrup, Organic Roasted Soybeans, Rice Flour, Dried Cane Syrup, Unsweetened Chocolate (3.1%), Organic Soy Flour, Organic Oat Fibre (3%), Organic High Oleic Sunflower Oil, Cocoa Butter*, Barley Malt Extract, Sea Salt, Natural Flavours, Soy Lecithin, Organic Cinnamon, Vitamins and Minerals: Minerals (Dicalcium Phosphate, Magnesum Oxide), Vitamins (L-Ascorbic Acid, DL-Alpha Tocopheryl Acetate, Beta Carotene, Nicotinamide, Ergocalciferol, Thiamin Mononitrate, Pyridoxine Hydrochloride, Riboflavin, Cyanocobalamin.